There is nothing better then a warm bowl of homemade soup on a cold winter day. I made a delicious variation of ham and potato soup that includes dumplings and lentils. I included lentils as part of the Pulse Pledge. You can find out more about that at www.pulsepledge.com . 1. Start by melting butter in a stock pot and then add onion, carrots, celery, garlic, and ham. Cook until onions are translucent. 2. Add flour and cook for 5 minutes. Add chicken stock to the pot and let simmer for 10 minutes. Add corn niblets. 3. Prepare lentils by adding 1 cup of lentils to 3 cups water. Cook for 15 minutes on a gentle simmer. 4. While the lentils cook peel and add potatoes to the soup and let cook for 15 minutes. Add cream and salt and pepper to taste. Add strained, cooked lentils. 1. Add all dry ingredients to a bowl and combine. Mix in margarine to a crumble consistency. 2. Mix in milk to form a soft dough. Drop by spoonful I to boiling soup and cover for 15 minutes. 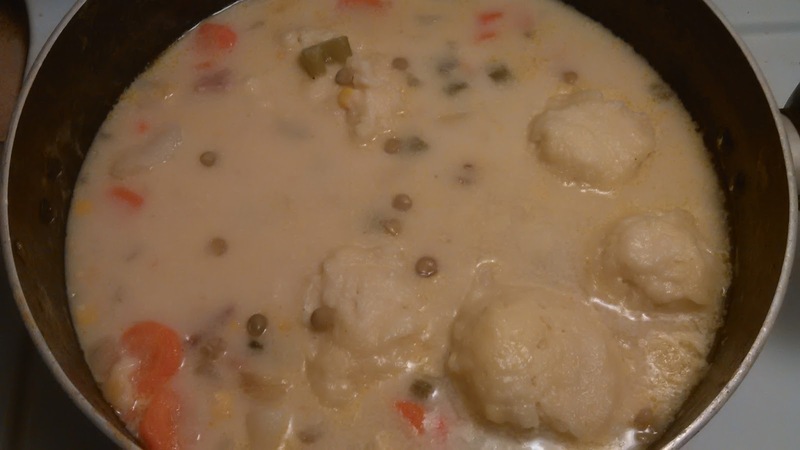 Enjoy this fantastic soup any day it is hearty and healthy making it a perfect meal.